Should Senate approve another $2b for cash for clunkers? The popular "cash for clunkers" program is out of cash; and its fate now lies in the hands of the Senate. The initial pool for rebates to trade in gas guzzlers was $1 billion; and the Obama administration says it will end the program next week if they don't get more money. The House already voted for an additional $2 billion. So far, the cash for clunkers program has led to the sale of 250,000 new vehicles. 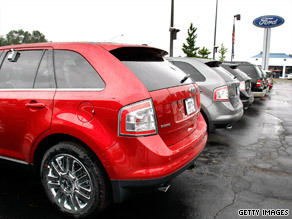 It helped bring Ford its first monthly sales increase in two-years. Also, the administration says that 62-percent of the traded-in vehicles are trucks; and people are replacing them with cars that get better mileage. Former Federal Reserve Chairman Alan Greenspan says car and truck building was rebounding even before this program started; but he adds that the "extraordinary response" shows confidence in the economy is picking up. Meanwhile - Republicans are asking how the government will be able to handle massive health care reform if they can't manage a smaller-scale program like this. Senator Jim Demint - one of the president's toughest critics these days - says it's an example of the "stupidity coming out of Washington right now." Senator John McCain has said he would lead a filibuster against the bill for the additional $2 billion. Here’s my question to you: Should the Senate approve another $2 billion for the "cash for clunkers" program? Global warming: What priority for Pres.-elect Obama? Apparently, the world is rapidly running out of time to curb global warming. There is a sense among many in the scientific community that global warming is accelerating and becoming a crisis much earlier than expected. After a meeting with former Vice President and Nobel Peace Prize winner Al Gore last week, President-elect Barack Obama said, "the time for delay is over, the time for denial is over." He went on to say that global warming is a matter of urgency and national security. Arctic ice is melting so fast that some scientists predict the Arctic waters won't have any ice left during the summer of 2013. Some species are becoming extinct, carbon dioxide levels are already exceeding safe limits, according to some scientists, and the list goes on. What was predicted to be years and years away is now apparently just around the corner. 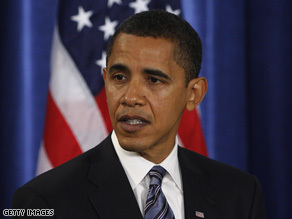 But in the midst of an economic crisis there may be limitations to Obama's urgent actions. And he has to get Congress to sign on too. Here’s my question to you: Where does global warming stand on President-elect Obama’s priority list? 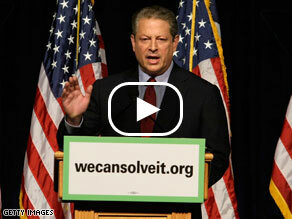 Gore’s call for carbon-free electricity in 10 years “ridiculous”? Click the play button to see what Jack and our viewers had to say. Al Gore says it will be like the challenge of landing a man on the moon. He's calling on the United States to switch all of this country's electricity production to wind, solar and other carbon-free sources within 10 years. Gore says our dependence on carbon-based fuels is at the core of our economic, environmental and national security crises. Here's how Gore sums up our dilemma. "We're borrowing money from China to buy oil from the Persian Gulf to burn it in ways that destroy the planet. Every bit of that has to change." The former Vice President and Nobel Peace Prize winner says the most important policy change will be to tax carbon dioxide pollution. Gore's bipartisan group estimates the 30-year cost of his plan is between $1.5 and $3 trillion. But some energy experts say Gore's plan moves way too fast, that the country won't be able to go "cold turkey" and get off fossil fuels in a decade. Others are even more critical. Republican Senator George Voinovich says it's "ridiculous" to think the nation could go carbon-free in 10 years. He says "We could take and put wind mills from the Atlantic to the Pacific and yes, it will increase the amount of carbon-free energy production, but the fact of the matter is, it's not going to get the job done." Coal supplies about half of the nation's electricity. It's also responsible for more than a third of the country's carbon dioxide pollution, which is most often blamed for global warming. Here’s my question to you: Is Al Gore’s call for carbon-free electricity in 10 years doable or “ridiculous”?